I was on the elliptical machine at the gym listening to Pandora a couple of weeks ago when this song popped up (on the Rihanna channel of all places!). The title was “What Can I Do? (But Love You)” and I was shocked to realize that the singer was Joy Williams from The Civil Wars, one of my very favorite groups. I immediately downloaded the song from iTunes and listened to the entire EP nonstop for a couple of weeks, and then decided that I wanted to learn to play that first song that had caught my ear at the gym. Unfortunately, the sheet music was nowhere to be found…I couldn’t even find the chords. So I learned it by ear instead. It’s been a long while since I sat down and played music for myself. By that, I mean music that isn’t new repertoire for my students or for a gig, but purely for my enjoyment. So it felt really good to learn and practice this song, under no pressure or time constraints whatsoever. After a couple days of playing, I decided to record it. My recording is definitely far from perfect, but the best part is that it doesn’t have to be, since it’s just for me :) Spending the time learning and playing this song was an excellent reminder that I need to do more of this. It’s good for my inner musician and good for the soul! Hellooooo, 3rd trimester! I can’t believe this pregnancy is 2/3 over, and I’ll have a newborn baby in my arms in 12 weeks or less. June seems so far away with all this snow on the ground, but in reality, it’s just around the corner. I had my 28-week doctor’s appointment last Friday, and got lots of good news: I passed my glucose tolerance test (no gestational diabetes for me) and the baby is growing just about on track! He’s a little on the small size right now, but that’s understandable considering he has smaller parents. In other baby news, we had to push back the nursery setup yet another week thanks to the snowstorm — we figured it would be silly to have all the carpets cleaned when Sadie was just going to muddy them up again once the snow began to melt. So the carpet is being cleaned on Monday, and then we’ll set up the furniture on Tuesday or Wednesday. Last weekend we took a whirlwind trip to Chicago for Zach’s AAA awards banquet, where he was named “Agent of the Year” for the 4th year in a row. Here we are displaying the latest trophies he added to the huge collection. This weekend will be relatively calm, and it will be nice to spend time with our families for Easter. It’s fun to think about having a little guy around next Easter to dress up in cute clothes! What do fish, turtles, ducks, and pigs have in common? The answer: they all have starring roles in my latest song, Animal Rock. I’ve already written about my new favorite instruments and how they inspired me to write this tune, but there are lots of other objectives that can be targeted at the same time. Just a few of those objectives include sound and movement imitation, taking turns, vocalization, creative expression…the list goes on. One of the coolest parts of being a music therapist is developing interventions that address several different goals at a time. It’s no coincidence that so many of us are master multitaskers! At 27 weeks, I am enjoying the LAST few days of my 2nd trimester and getting ready for the final stretch! Finally! These last couple of weeks have been relaxing (or at least as relaxing as my life gets), and I am savoring every last second because that’s going to end soon. Beginning in April, we have a big vacation to go on, three baby showers, and LOTS of baby prepping to do. It’s all fun and exciting, but it also sort of makes my head spin thinking about it. The rest of March is pretty low key, although we are heading to Chicago on Saturday for Zach’s company awards banquet. Next weekend will be almost entirely devoted to nursery decorating (oh, and celebrating Easter too). We go back to the doctor for my monthly check-up this Friday, and I’ll also be taking my glucose tolerance test. Fingers crossed that the results are negative for gestational diabetes. After that, I start going every 2 weeks instead of every 4. Fun stuff! Most of the time, my songs are inspired by specific goals and objectives. But every once in a while, I’ll write a song for a specific instrument — and this is one of them! Last month as I was going through the West Music catalogue choosing instruments for my early childhood music class, these animal jingle bells caught my eye. I knew that the cute shapes and bright colors would appeal to my kiddos, so I ordered them and then got to work on a new song. Each animal has a featured role in the song, and a specific movement or sound to perform. When I use this song in a group setting, I have the children identify which kind of animal they have, and then they take turns with their movements or sounds. If I’m working with a child one-on-one, I ask them to choose the correct animal for each verse and then do each movement and sound. 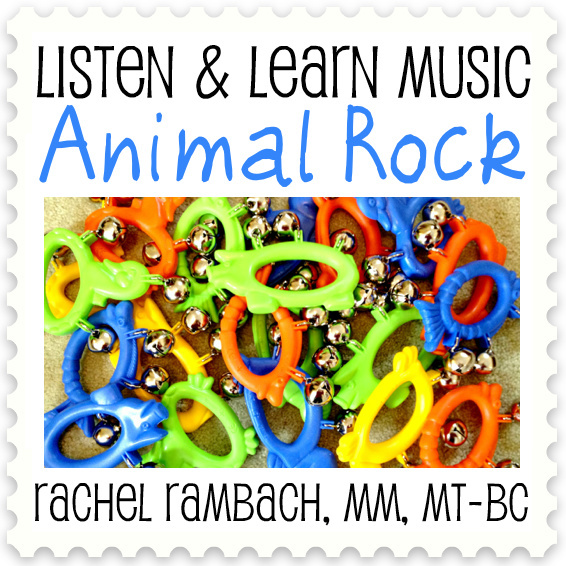 Even if you don’t have these bells on hand, this song can be used without instruments all together and instead let the children act as the animals themselves! There’s nothing like a little creative role play ;) And you definitely don’t have to stick to the four creatures mention in the song…let the kids use their imagination and add their own verses.